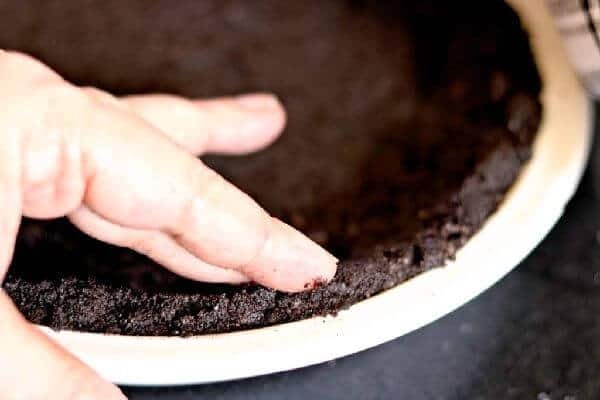 Homemade Oreo cookie crust is so easy to make from scratch – and it’s the perfect way to add pizazz to your favorite, no bake pie recipes! You need just two ingredients (plus a little extra sugar if you want) for this chocolate crumb pie crust! 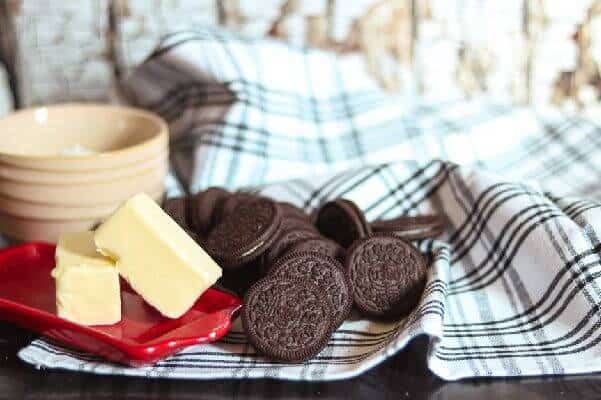 For this recipe you need: Oreo sandwich cookies (any kind will do but for this recipe I used the traditional one. ), butter, and sugar if you want it sweeter. In fact, it took me ten years to learn to make a decent pie crust. Ten years, y’all. It was an embarrassment. My favorite pies have always had some sort of chocolate in them so it was only a matter of time before I threw some Oreo cookies in the blender and created the most perfect pie I’d ever tasted. I made peanut butter pies, chocolate cream pies, banana cream pies, cherry tarts…. just about any kind of pie you can name and all with chocolate crusts. Here’s a tip though… don’t use a chocolate crumb crust for rhubarb pie – trust me. Pretty soon I was making pies for all kinds of things and people thought I was so imaginative because I was using all these luscious crumb crusts. They never suspected it was because I was inept at making regular crusts! Since the Oreos have that creamy filling they are super easy to make and hold together well. Whether or not you adda little extra sugar is totally up to you – It kind of depends on how sweet you like it. And you don’t need to limit yourself to just the traditional chocolaty Oreos, either! They are ALWAYS coming out with unique, seasonal flavors and literally any Oreo cookie can be substituted for any other one in this easy no-bake pie crust! The main tip I have for you is to break up the cookies with your hands before adding them to the blender or food processor. It’s easier to turn them into crumbs this way – and you’re less likely to find big cookie chunks in your pie crust. How many Oreo cookies make 2 cups of crumbs? It takes about 22 cookies to make one crust. A standard size package of Oreos is about 36 cookies. How many Oreos are in a family package? There are about 48 cookies in a family sized package. How do you crush Oreos for crust? The easiest way is to put them in a blender or food processor. If you don’t have one of those available just put them in a plastic bag and smash with a rolling pin. It’s very satisfying on a particularly frustrating day. Can you bake a premade Oreo pie crust? Yep, if you happen to have a premade crust lying around you can certainly bake it if you need to. Making a crumb pie crust is super easy with this simple Oreo cookie recipe! Just 2 or 3 ingredients! 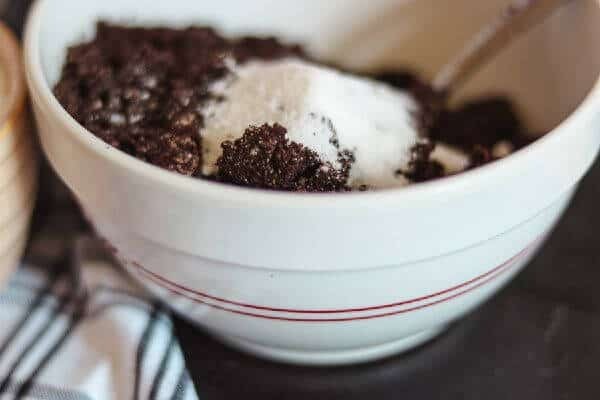 It’s so easy to make an Oreo crumb crust! Follow these simple directions and your pie crust will be ready in no time! Break the Oreos with your fingers and put them, a few at a time, in a blender jar. A food processor works as well. Pulse the blender or food processor in short bursts until all the cookies in the jar are even sized crumbs. Remove the crumbs from the blender and place them in a large bowl. Repeat the steps until you have about 2 cups of Oreo crumbs. In another, microwave safe, bowl melt the butter in the microwave. If you’d like your crumb crust to be very sweet add a tablespoon or so of sugar to the crumbs and mix well. Stir the melted butter into the crumbs, a little at a time, until the crumbs hold together when you smoosh them in your hand. Press the crumbs firmly in the bottom and up sides of your pie plate. It’s best to freeze the Oreo crumb crust for 15 minutes or so before adding the pie filling of your choice. If you bake the crust it will be a little more crispy. Just bake for 10 minutes at 350F and then let cool before adding the filling. I love no-bake pies. Being from Texas we experience some scorching weather, especially during the summer. Baking anything is out of the question so we use a lot of no bake desserts to satisfy that legendary southern sweet tooth. Texas Flood Pie – Chocolate, chocolate, and more chocolate then add pecans and marshmallows. SO good. It’s a deluge of chocolaty goodness! S’mores Pie – Creamy chocolate filling with a toasted marshmallow topping, this one is hard to resist! 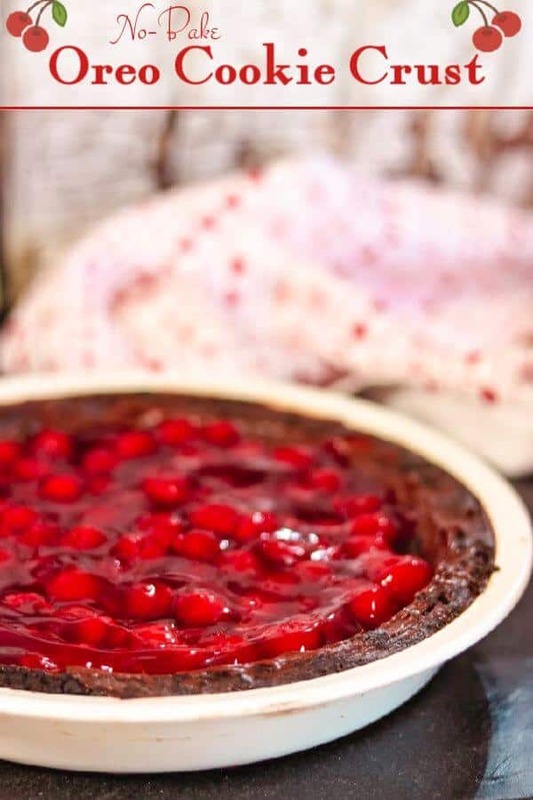 Millionaire Pie – A potluck classic! A decadently rich and creamy pie that’s jam-packed with coconut, Maraschino cherries, pineapple, and toasted pecans. Coconut Praline Pie – A layer of pecan praline is topped with a dreamy coconut filling then topped with whipped cream and toasted coconut. SO good! Try the Golden Oreos for this. Salted Butterscotch Banana Cream Pie – Keep this no-bake by ditching the meringue and using whipped cream. I’ve been eyeing this Butterfinger Pie from Plain Chicken…and thinking this crust would be amazing with it. A food processor or blender is a must for making crumbs quick and easy – as well as a TON of other things. I love this Oster Pro because it’s not extremely expensive AND it does BOTH!!! I love an easy dessert and nothing is easier than this no-bake pie crust! Fill it with ice cream, pudding, or any of your favorite pie fillings. If you love this recipe please give it 5 stars! Use this easy Oreo cookie crust any time you don’t want to make a traditional pastry crust. Be creative! Every flavor of Oreo works perfectly! 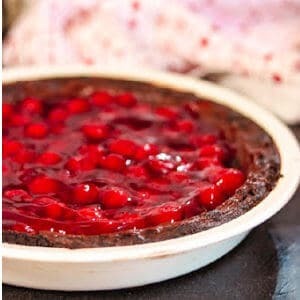 Mix and match crusts and fillings for unique, delicious no-bake pies! Add cookies, a few at a time, to a blender or food processor to make crumbs. Pour the crumbs in a bowl and add sugar if desired. 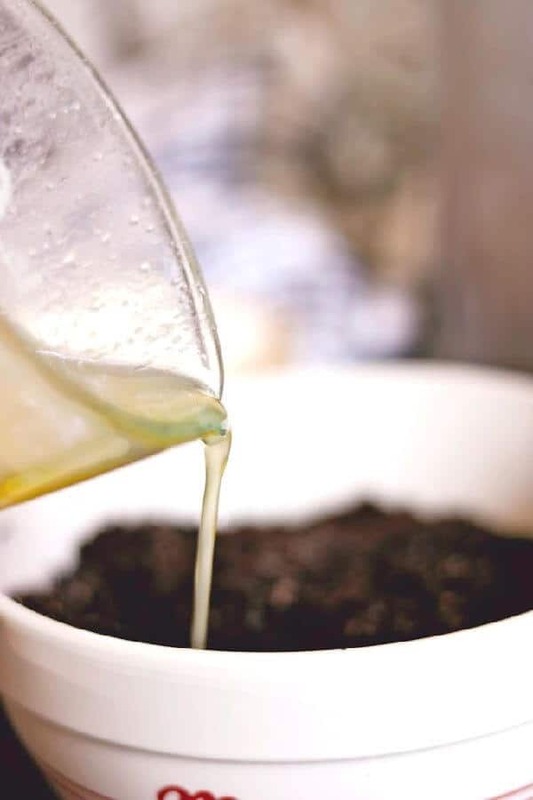 Pour the melted butter into the Oreo cookie crumbs, mixing with a fork until it holds together when compressed in your hand. Add the crumbs to a 9-inch pie plate and press down firmly to create an even layer of crust on the bottom and up the sides. Chill for 30 minutes if you have time. Fill and use as directed in recipe.